A stylishly simple pair of 3mm ball stud earrings, crafted in sumptuous 9ct rose gold for irresistible warmth. Perfect for paired-down everyday chic. 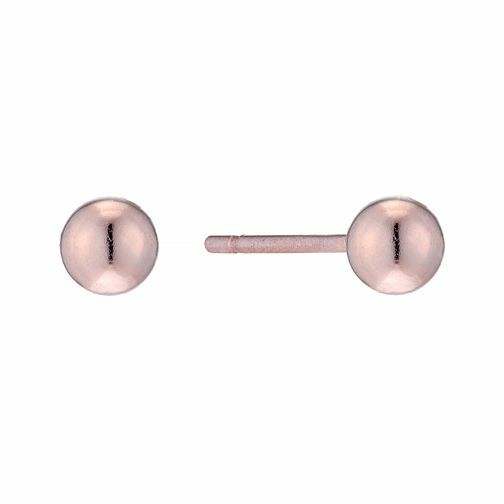 9ct Rose Gold 3mm Ball Stud Earrings is rated 2.5 out of 5 by 4. Rated 1 out of 5 by Anonymous from Awful quality Bought these for my young daughter for her birthday, paid for next day delivery as had no luck finding decent earrings (reasonable cost) to date. Earrings arrived and on taking the back off the second earring it fell apart - the stem detached from the ball. They were returned to store the same day - was refunded, although no postage refund even though the goods were faulty and I had to go in to town to get them refunded (and pay parking). I had purchased a second pair of earrings with these but returned those unopened. These studs are extremely fine, the stem is thinner than i've seen anywhere else (in fact I ended up purchasing similar ball studs from a different jeweller and these were much more sturdy). Terrible quality.. cheap pricing but then you get what you pay for. Postage should be refunded when goods are faulty - not a happy customer.